Summer school just finished for me at Rebecca School, so now I'm on a three week break. When I return it'll only be twice a week to run workshops which is exciting and a little duanting. It's going to be a big change both professionally and personally for me. I've taken some time to pause and reflect over the break and in that reflection, I've realized what a special time summer can be for teachers. Summer is an amazing opportunity for experimentation and change. Long white table full of supplies. In the foreground are paper plates with rainbow colors, a bag of yellow cuts and a black expo marker. Next there’s a green poster board cut to look like a crocodile with an eye drawn, on the green poster paper are scissors and white paper cut to look like teeth. The table extends with more rainbow plates in the background. It was over a summer session that I first ran workshops at Rebecca School and it was summer time when I first really tested the Sensorimotor Poetry Workshop model. The lack of academic pressures makes it a season for discovery and even rediscovery. Outside of school walls, summer is also the time of year when I work with the New York Restoration Project, or NYRP, running programming in their gardens! This is always a lot of fun, it's nice to be outdoors and to have an opportunity to do some nature play. This summer the workshops are "Ceramic Stories" involving students painting a story onto a pot like Greek pottery. Once the pots are painted they'll plant something hardy in them and take the plants home to have something to grow! Orange/Brown ceramic pots on a white table cloth with various shades of paint in purple and white pots. Some paintings are visible on the pots, others appear blank. In the background is a vibrant teal slatted fence with red poppies painted on. As a hiker and outdoor enthusiast myself, it's a wonderful opportunity to blend that passion with my poetry and education work. This year I'm running two sessions: one was at the Lucille McClary Wicked Friendship Garden in June and the next one will be in September at the Rodale Pleasant Community Garden. 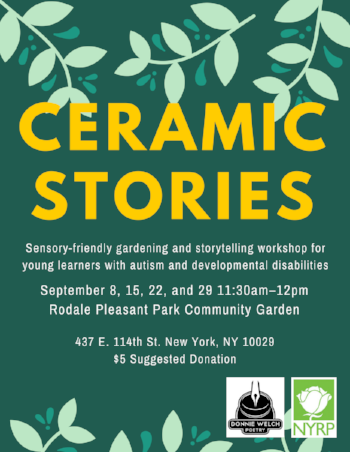 Flyer for a program called “Ceramic Stories” Cartoonish vines grow from the top, followed by the title in bold yellow letters and the details in smaller white lettering. In the bottom right are logos and finally a border of vines appear to grow up from the bottom. All on a dark green background. Meanwhile, in school, I started a "Shadow Puppet Poetry" unit with a couple of the groups . We've gone and visited the roof playground to catch the sun and trace our full shadows onto poster paper, along with some silly hand-animals made along the way as well. We also stayed indoors on a rainy day and played with flashlights. Where exactly this project will lead I'm not sure yet, but it's a ton of fun and is a great body awareness and sensory practice for the students. With so many amazing things going on over the summer, I'm sure I'll be back in school before I know it! When I am, it'll be the start of a whole new adventure!